Refresh a girl's bedroom with this super adorable bed set. What's practical about this design is it is appropriate for both the little girl and the 'tween girl! 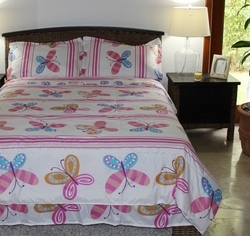 Your little girl will be thrilled to fall asleep surrounded by beautiful butterflies. The high quality super soft 95 GSM microfiber comforter features fun, large scale butterflies in pink, blue, and orange designs with coordinating sham(s), and bed skirt. Perfect for any girls bedroom. It's machine washable for easy care. Available in twin and full sets. 1 Comforter 66" x 86"
1 Comforter 76" x 86"
1 Bed Skirt 54" x75"